I baked them all in 350 degrees F temperature, rather than the higher temperatures suggested in some of the recipes (my electric oven easily burns baked goods, at higher temperatures). To make the cookies, I used mini cupcake baking pan. I placed a dough ball in each cup and pressed it down with a Reese’s Peanut Butter Cup in the center of each. These cookies are very flaky and fragile, so handle with care when removing from a pan onto a cooling rack. The recipe yields over 50 cookies. 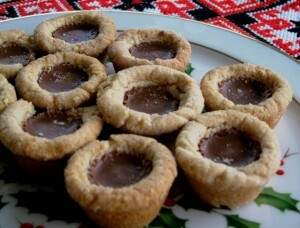 The above pictured are Chocolate-Mint Thumbprints; a recipe from Betty Crocker. 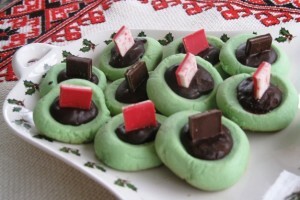 In my opinion, these cookies are very tasty, however the peppermint extract is very overpowering, so next time I would use only few drops, rather than the 1.5 tsps., as suggested in the original recipe. Also, I stored these cookies in an air-tight container, and served separately, to prevent the peppermint aroma from overcoming my whole cookie arrangement. These cookies resemble snicker-doodles, but the ingredients are quite different. 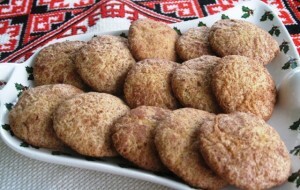 The original recipe for these Apple Cinnamon Cookies was posted on Lulu the Baker site. I was very excited about the fresh apples as one of the ingredients in this recipe, making it kids friendly (no nuts), especially for kids with nut allergies. These cookies are not overly sweet either, and very soft on the inside, yet gently crispy on the outside. I will definitely be baking them again next year, for my grandchildren. This recipe yields over 60 cookies.